Nowadays, most people probably wouldn’t even know what stinging nettle is. Many would be surprised to learn that it has a long history as one among plants foraged from the wild and eaten as a vegetable and used as a medicine. However, it is getting more and more popular as we are becoming aware of its remarkable nutritional value along with its diverse and impressive, to say the least, range of medicinal effects, proven by modern science. Nettle requires rich, moist soils and loves old damp sites, compost, and manure piles. Not long ago it was a common weed on small farms and was of great benefit there. Being very rich in vitamins and microelements (including very rare ones like Boron), and having high protein content, it was a nutritious spring greens, farm animals fodder and excellent compost maker. Back then I was, as most of us, a “free range child”. We studied life and botanics hands on. We knew what plant to chew when hungry and what leaf to put on a fresh scratch. Sure enough, we recognized nettle and respectfully avoided it, yet still got stung by it so many times! But when we needed a rope for our play, we wove it from nettle stems, overcoming pain and itching, as a little girl from the Hans Christian Anderson’s tale did, while she had been weaving shirts from nettle for her eleven brothers. We knew that there was nothing to be afraid of – nettle was considered to be so healing that even its stings were appreciated. Weaving from nettle wasn’t just a tale. Fibre from thick, square, hairy stems of nettles was woven into “linen” all over Europe. In Scotland, the material was used well into the seventeenth century, and was claimed to be one of the most durable fabrics. Europeans and native Americans also utilized nettle fibre to make strong ropes and superior fishing nets. Medicinal properties of nettle were well known for thousands of years and there wasn’t a single nation that didn’t brew a healing nettle tea. Recent studies confirm that stinging nettle has a number of active components that affect feminine health by normalizing menstruation and minimising menopause symptoms, inhibits prostate growth, relieves fatigue and anemia, lowers high blood pressure, slows the onset of osteoporosis, relieves a variety of respiratory conditions, including hay fever, asthma, and other seasonal allergies, and effectively cleanses kidneys and gallbladder, even dissolving small stones. 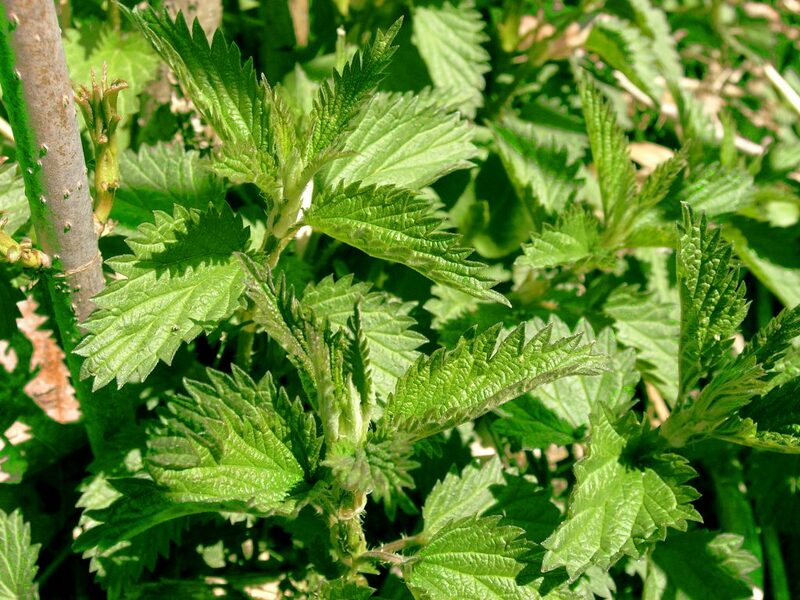 Nettle was widely used in cosmetics and personal care items such as soaps and shampoos. Its extract was always the first remedy for dull, thin hair and skin problems. Vitamin B- complexes as well as thiamin, riboflavin, niacin, B-6 all of which are act as antioxidants. Boron, Bromine, Calcium, Chlorine, Chlorophyll, Potassium, Phosphorus, Sodium, Iodine, Chromium, Silicon and Sulphur. Unfortunately, today in Canada nettle became somewhat scarce. We keep our parks, back yards and lawns neat and tidy, leaving no place for weeds. I missed nettle so much and was looking for it unsuccessfully everywhere each spring, until we decided to move to a country. The piece of land we’d bought had been neglected for a long time and turned out to be our luck not only price wise- I found a precious nettle at last. It grew on its favourite spot – an old forgotten compost pile, struggling among a forest of burdocks and goldenrod. Now I am simply cultivating a small patch of it, protecting it from cows and everybody else as my animals seem to love nettle even more that I do. It is very easy to grow, as long as you water it frequently and feed the patch generously with compost or simply table leftovers. It spreads both by rhizomes and seeds and can be quite aggressive if it likes the spot. It grows rapidly and gives 2-3 harvests of young shoots for Nettle Soups in the spring. Later in the summer, when it blooms, it may be dried for teas or tinctures and extracts. When foraging for nettles, or picking it in a garden, have a pair of garden gloves handy to protect your hands from stinging. Use scissors to cut the tops as pulling would damage the roots and slow down the re-growth process dramatically. As soon as nettle wilts, it looses it’s ability to sting. When using it fresh for cooking, put it in a bowl of boiling water for a few seconds first or just poor a boiling water over it. After that you may safely handle it with bare hands, it will not sting any more. But if you get stung by chance, do not worry – remember, nettle is so healing, that even its stings are good for you.